The non-native Elongate Hemlock Scale (Fiorinia externa), which is sometimes called "Fiornia scale," occurs on the underside of needles and on cones. It may infest its namesake host as well as on other conifers including firs, Douglas-fir, spruces, cedars, pines, and yews. The scale was accidently introduced to the U.S. from Japan and was first found in New York, NY, in 1908. Currently, it's found in much of the native range for eastern hemlock (Tsuga canadensis) and Carolina hemlock (T. caroliniana). Where it overlaps with the non-native Hemlock Woolly Adelgid (Adelges tsugae), the two sucking insects can produce a one-two punch exacerbating the impacts of both. I've been monitoring an infestation in southwest Ohio for a number of years. The common name is descriptive. Mature females are covered by a waxy slightly translucent "test" that is elongated and parallel-sided. The test ranges in color from yellowish-brown to brownish-orange. The waxy tests covering mature males are white and also elongated. The mobile soft bodied first instar nymphs (crawlers) are lemon yellow. Second instar nymphs (settled crawlers) are also soft bodied; however, they are sedentary and enclosed in an oval, amber-colored covering. The settled crawlers secrete waxy white filaments. Occasionally, the underside of infested needles may become covered by tangled strands of this white flocculent material. 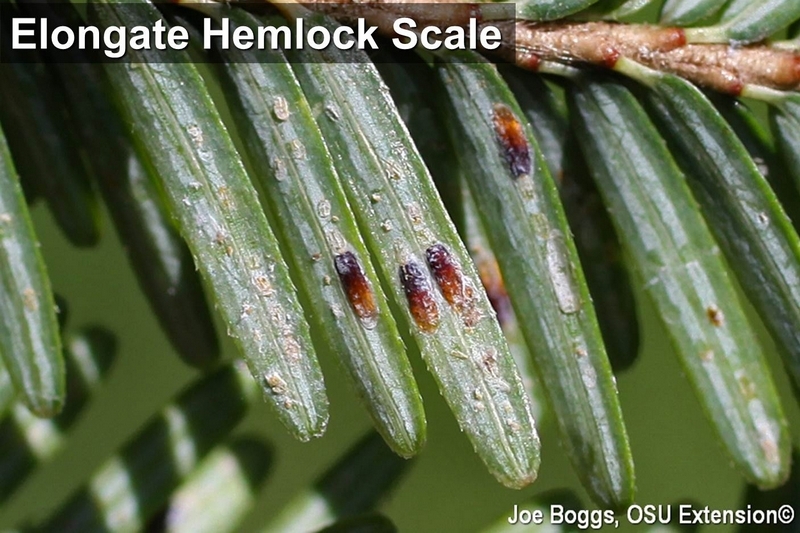 Like all armored scales, the elongate hemlock scale feeds by inserting their piercing-sucking mouthparts into needles to withdraw nutrients from meshophyll cells. Damage symptoms include yellow banding on the needles, overall needle yellowing, and needle loss. Severe damage will produce branch dieback. Heavy infestations also weaken trees making them more susceptible to other pests or death from environmental challenges such as drought. Management of this scale is made difficult because all life stages may be present at the same time during the season. Foliar insecticide applications targeting crawlers have been shown to be effective; however, multiple applications are required. Summer applications of the systemic insecticide dinotefuran (e.g. Safari) have been shown to be effective in suppressing elongate hemlock scale; however, imidacloprid (e.g. Merit) is not effective against armored scales.